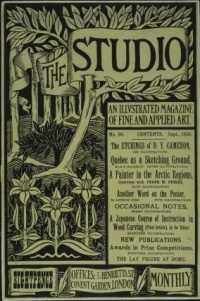 This is a poster for The Studio, illustrated with a line-block forest image by Aubrey Beardsley. Aestheticism (or the Aesthetic Movement) is an art movement supporting the emphasis of aesthetic values more than socio-political themes for literature, fine art, music and other arts. It was particularly prominent in Europe during the 19th century, but contemporary critics are also associated with the movement, such as Harold Bloom, who has recently argued against projecting ideology onto literary works, which he believes has been a growing problem in humanities departments over the last century. In the 19th century, it was related to other movements such as symbolism or decadence represented in France, or decadentismo represented in Italy, and may be considered the British version of the same style. The Aesthetic movement is a loosely defined movement in literature, art and interior design in later nineteenth-century Britain. Generally speaking, it represents the same tendencies that Symbolism or Decadence stood for in France, and may be considered the British branch of the same movement. It belongs to the anti-Victorian reaction and had post-Romantic roots. It took place in the late Victorian period from around 1868 to 1901, and is generally considered to have ended with the trial of Oscar Wilde. The British decadent writers were much influenced by the Oxford professor Walter Pater and his essays published during 1867–68, in which he stated that life had to be lived intensely, with an ideal of beauty. His text Studies in the History of the Renaissance (1873) was very well regarded by art-oriented young men of the late 19th century. Writers of the Decadent movement used the slogan "Art for Art's Sake" (L'art pour l'art), the origin of which is debated. Some claim that it was invented by the philosopher Victor Cousin, although Angela Leighton in the publication On Form: Poetry, Aestheticism and the Legacy of a Word (2007) notes that the phrase was used by Benjamin Constant as early as 1804. It is generally accepted to have been promoted by Théophile Gautier in France, who interpreted the phrase to suggest that there was not any real association between art and morality. The artists and writers of Aesthetic style tended to profess that the Arts should provide refined sensuous pleasure, rather than convey moral or sentimental messages. As a consequence, they did not accept John Ruskin and Matthew Arnold's utilitarian conception of art as something moral or useful. Instead, they believed that Art did not have any didactic purpose; it need only be beautiful. The Aesthetes developed a cult of beauty, which they considered the basic factor of art. Life should copy Art, they asserted. They considered nature as crude and lacking in design when compared to art. The main characteristics of the style were: suggestion rather than statement, sensuality, great use of symbols, and synaesthetic effects—that is, correspondence between words, colours and music. Music was used to establish mood. Predecessors of the Aesthetics included John Keats and Percy Bysshe Shelley, and some of the Pre-Raphaelites. In Britain the best representatives were Oscar Wilde and Algernon Charles Swinburne, both influenced by the French Symbolists, and James McNeill Whistler and Dante Gabriel Rossetti. The style and these poets were satirised by Gilbert and Sullivan's comic opera Patience and other works, such as F. C. Burnand's drama The Colonel, and in comic magazines such as Punch. Compton Mackenzie's novel Sinister Street makes use of the type as a phase through which the protagonist passes as he is influenced by older, decadent individuals. The novels of Evelyn Waugh, who was a young participant of aesthete society at Oxford, describe the aesthetes mostly satirically, but also as a former participant. Some names associated with this assemblage are Robert Byron, Evelyn Waugh, Harold Acton, Nancy Mitford, A.E. Housman and Anthony Powell. Artists associated with the Aesthetic style include James McNeill Whistler, Dante Gabriel Rossetti, and Aubrey Vincent Beardsley. Although the work of Edward Burne-Jones was exhibited at the Grosvenor Gallery which promoted the movement, it also contains narrative and conveys moral or sentimental messages hence it falls outside the given definition. Important elements of the Aesthetic Movement have been identified as Reform and Eastern Art The Government Schools of Design were founded from 1837 onwards in order to improve the design of British goods. Following the Great Exhibition of 1851 efforts were intensified and Oriental objects purchased for the schools teaching collections. Owen Jones, architect and Orientalist was requested to set out key principles of design and these became not only the basis of the schools teaching but also the propositions which preface The Grammar of Ornament 1856, which is still regarded as the finest systematic study or practical sourcebook of historic world ornament. Jones identified the need for a new and modern style which would meet the requirements of the modern world, rather than the continual re-cycling of historic styles, but saw no reason to reject the lessons of the past. Christopher Dresser, a student and later Professor at the school worked with Owen Jones on The Grammar of Ornament, as well as on the 1863 decoration of The Oriental Courts (Chinese, Japanese, and Indian) at the South Kensington Museum, advanced the search for a new style with his two publications The Art of Decorative Design 1862, and Principles of Design 1873. Ebonized wood with gilt highlights. Prominent use of nature, especially flowers, birds, ginkgo leaves, and peacock feathers. Blue and white on porcelain and other fine china. Ebonized furniture means that the wood is painted or stained to a black ebony finish. The furniture is sometimes completely ebony-colored. More often however, there is gilding added to the carved surfaces of the feathers or stylized flowers that adorn the furniture. As aesthetic movement decor was similar to the corresponding writing style in that it was about sensuality and nature, nature themes often appear on the furniture. A typical aesthetic feature is the gilded carved flower, or the stylized peacock feather. Colored paintings of birds or flowers are often seen. Non-ebonized aesthetic movement furniture may have realistic-looking 3-dimensional-like renditions of birds or flowers carved into the wood. Contrasting with the ebonized-gilt furniture is use of blue and white for porcelain and china. Similar themes of peacock feathers and nature would be used in blue and white tones on dinnerware and other crockery. The blue and white design was also popular on square porcelain tiles. It is reported that Oscar Wilde used aesthetic decorations during his youth. This aspect of the movement was also satirised by Punch magazine and in Patience. In 1882, Oscar Wilde visited Canada where he toured the town of Woodstock, Ontario and gave a lecture on May 29 entitled; "The House Beautiful". This particular lecture featured the early Aesthetic art movement, also known as the "Ornamental Aesthetic" art style, where local flora and fauna were celebrated as beautiful and textured, layered ceilings were popular. A gorgeous example of this can be seen in Annandale National Historic Site, located in Tillsonburg, Ontario, Canada. The house was built in 1880 and decorated by Mary Ann Tillson, who happened to attend Oscar Wilde's lecture in Woodstock, and was influenced by it. Since the Aesthetic art movement was only prevalent from about 1880 until about 1890, there are not very many examples of this particular style left nowadays. The philosophies of irrationalism and aestheticism formed as a cultural reaction against positivism during the early 20th century. These perspectives opposed or deemphasized the importance of the rationality of human beings. Instead, they concentrated on the experience of one's own existence. Part of the philosophies involved claim that science was inferior to intuition. Art was considered especially prestigious, as it was considered to represent the noumenon. The style was not accepted greatly by the public, as the social system generally limited access of the art to the elite. Some of the proponents of this style were Fyodor Dostoevsky, Henri Bergson, Lev Shestov and Georges Sorel. Symbolism and existentialism derived from these philosophies. Unless indicated otherwise, the text in this article is either based on Wikipedia article "Aestheticism" or another language Wikipedia page thereof used under the terms of the GNU Free Documentation License; or on original research by Jahsonic and friends. See Art and Popular Culture's copyright notice. This page was last modified 14:08, 13 April 2018. This page has been accessed 11,611 times.